Emily Chambers had enjoyed some success as a house flipper in San Antonio, Texas, but she and her business partner made one bad decision and ended up with a money pit that led to financial disaster. Divorced for eight years from her irresponsible ex who never makes his child support payments for their daughter, Chloe, Emily had few options when she ended up broke and in debt. Things were so bad that she was forced to borrow $10,000 from her grandmother, Gigi. To repay Gigi, Emily has committed herself to renovating one of her grandmother’s rental cottages. Said cottage is located in Trillium Bay, the tiny town on Wenniway Island in northern Michigan, the hometown Emily fled with Chloe’s father more than a dozen years earlier and to which she has rarely returned. Although Emily is close to her grandmother and her sisters, Brooke and Lilly, her relationship with her father is distant. That relationship is just one of the qualms Emily has about spending a summer in a place where everybody knows her as “Peach,” remembers her wild-child past, and has an incessant curiosity about her present. Chloe, in the throes of early adolescence, is not thrilled with the lengthy visit either. Emily and Chloe are not the only reluctant visitors to Wenniway Island. Ryan Taggert is not happy about leaving his fast-paced life in California for the snail-pace of Trillium Bay, but he and his brothers are concerned that their fifty-nine-year-old father is talking about retiring as president and CEO of the family business, Taggert Property Management, a big name in the hospitality industry. They are equally concerned about the new woman in his life. The Taggert brothers are convinced the woman is a money-hungry bimbo from whose clutches their father needs to be rescued ASAP. The only good thing on the island in Ryan’s opinion is Emily Chambers, but any relationship with her is complicated by the fact that his father’s “bimbo” turns out to be Emily’s twenty-six-year-old sister, Lilly, and further jeopardized by Ryan’s business dealings on the island. This first novel in Brogan’s new Trillium Bay series is filled with her trademark humor and engaging characters who prove that comedy and complexity are not mutually exclusive. Emily, with a middle-child’s need to assert herself, has made mistakes, but she cannot regret the choice that led to her daughter. She hopes that the summer will give her a chance to regroup and perhaps to heal some old wounds. Emily’s relationship with her family and her hometown is as significant as the central romance. Ryan, the youngest of three brothers, initially wonders how his father can tolerate the narrowness of small-town life, but ironically discovers that his Trillium Bay experience has enlarged his life. Trillium Bay itself offers charm and a presence so vivid that the smell of fudge and lilacs almost permeates the pages. The secondary characters add color and interest to the story. Chloe is fully dimensional in her mood swings and in her mix of sweetness and self-absorption, and other family members, especially the much-married Gigi, add to the wit and addictive appeal of the book. The quirky locals are also a delight. 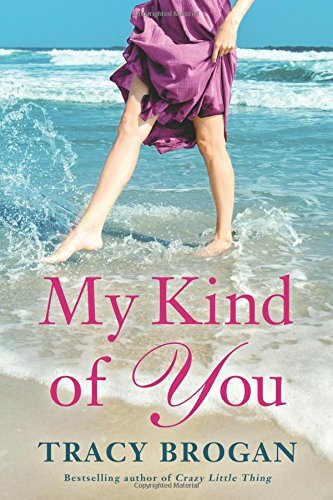 If you like small-town romances that make you laugh, warm your heart, and satisfy your need for context, I suggest you add this one to your TBR list. But be warned that My Kind of You is a most effective hook that will leave you eager to sign on for the series. Sounds good. Thanks for peek. PJ loved this one too, ladbookfan, so it comes with a double recommendation. Sounds fun, Janga, and like a good beach read. I am craving small town series lately. Irish, my fave small-town series are those in which the town comes across as real and distinctive enough to invite a visit. Trillium Bay qualifies. Any book which makes me laugh and gives me romance is gonna be one of my favs. This one is a delight, Annette. sounds like a wonderful book, and it's receiving a lot of accolades. Thanks for the introduction to a new to me author and what sounds like a good book. I enjoy small town stories. This will be a series I need to check out. I haven't read any of her books, so thanks for the recommendation.